January 19 | 2019. Seminole Canyon and More | Peter M. Schloss | J.D. - Mediator. We spent the last two nights camped in Seminole Canyon State Park, another excellent Texas facility. 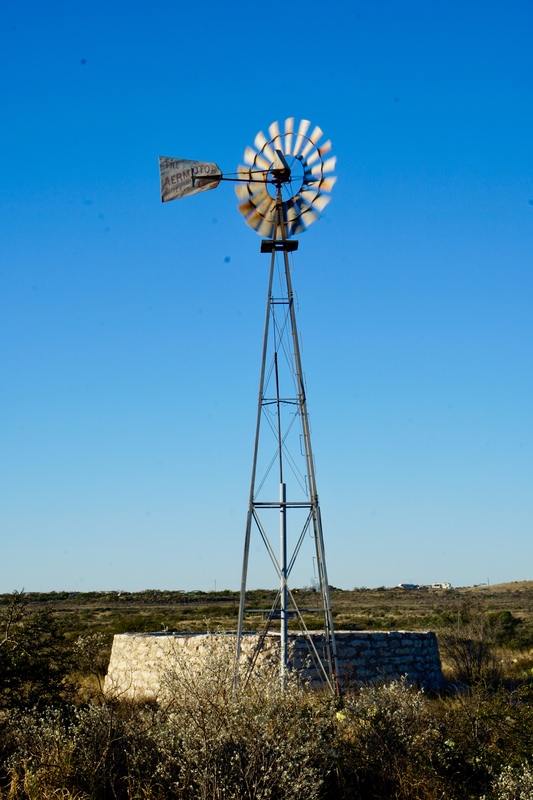 The Park is situated along the rim of Seminole Canyon in the Seminole Canyon Archeological District. The Canyon is known for its wealth of artifacts and cave art left by a very early indigenous people. Little is known about them except that they were nomadic hunter gatherers who traveled in small bands. They hunted using the atlatl and spear. They made creative use of the canyon cliffs by stampeding the now extinct species of bison over the edge and then harvesting the kill below. The understory of the cliffs provided shelter and a place to prepare food in dugout pits. There were ritual burials, and magnificent cave paintings that have been carbon-dated to before 4,000 BCE. Modern tribal Indians do not claim a connected heritage to these very early inhabitants. 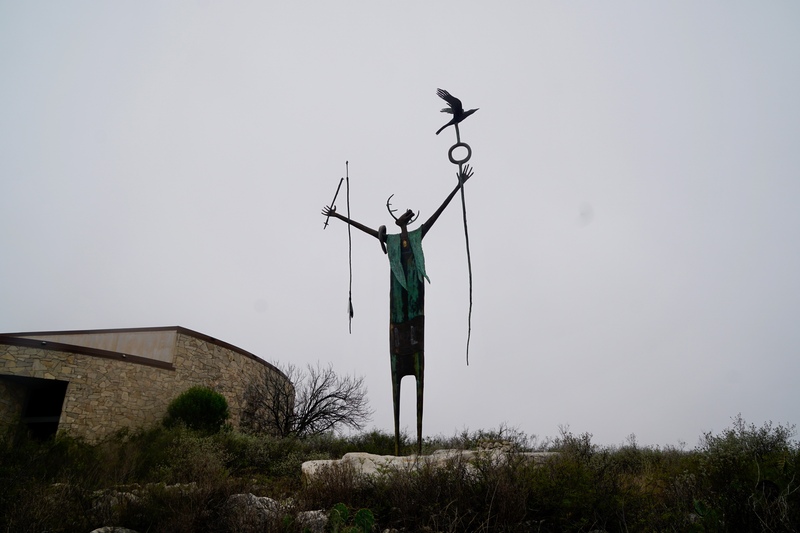 At the entrance to the Visitors Center is The Maker of Peace, a 17-foot bronze statue created by Texas artist Bill Worrell in 1994. Errata: we are on our way to South Padre Island (SPI) where we have reserved a campsite for 4 nights commencing Sunday. We will be hanging out with dear friends and former neighbors Hal and Jane Gilchrist. We will watch the Chief’s pursue their bid for the Super Bowl, dine, reminisce, and perhaps sip a wee dram or three of Eagle Rare Whiskey. The Gulf is offering us sunny skies and daytime temps in the 70’s. From SPI we will make our way to New Orleans where we will camp 3 nights within walking distance of the French Quarter. Christine will then fly back to Kansas City while I solo on for another 10-14 days. Her 100 year old Father is doing reasonably well, but there are concerns sufficient for her to make an early exit from this journey. It is likely that I won’t be posting during our stay on SPI. Where I go and what I do after New Orleans will be largely determined by whim and weather. PS. While hiking in Davis Mountains State Park I encountered a delightful couple, Jim and Wilma. They are retirees who are traveling full time with their RV. On the trail we talked of travel and enjoying life as health allows, one day at a time. Early this morning as I walked back to our trailer from my shower I saw Jim. He was breaking camp and there was an obvious sense of urgency in his actions. I greeted him and saw that there were tears in the eyes of the big retired trucker. He explained that Wilma suffered a sudden medical crisis the previous day and underwent emergency surgery. She is recovering in ICU and Jim expressed tenuous optimism for her. Those are fabulous petrogliphs. And the sunset picture is beautiful. Safe travels. Prayers for Wilma and Jim, as for Chris and Mr. Nichols – I get it! On a happier note, isn’t it amazing to you that the paintings on the cliffs and caves could have remained for al these years. Wouldn’t you have liked to have been a fly on the wall the day they were painted? Babe, if the paint on my house would only last 10 years… let alone 6,000! I read this with sadness. Not only of the years ago dwellers but for Jim and Wilma.. I pray Bill is ok and Wilma is recovering. We do not know what fate hand us?? ?